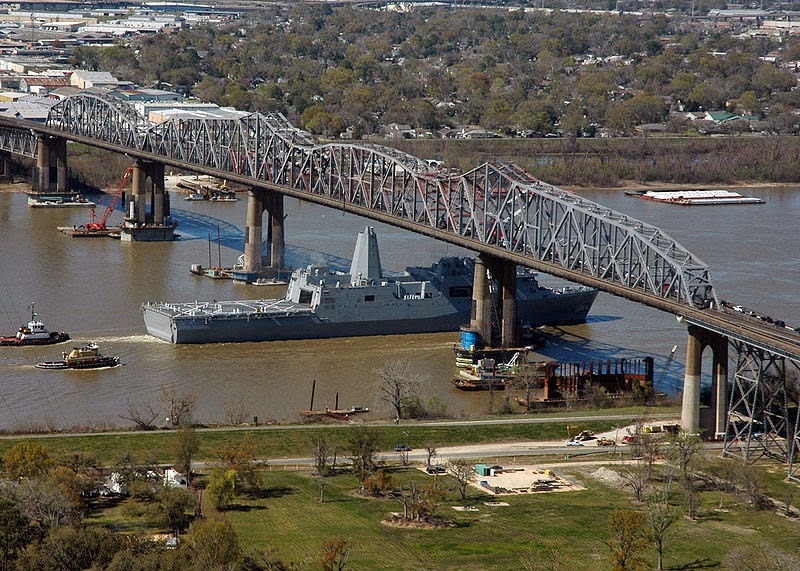 The Huey opened in 1935, the year its namesake, Huey P. Long, was shot and killed in the lobby of the State Capitol in Baton Rouge. As governor, Huey levied taxes on oil production in Louisiana. With that money he built both The Bridge, and the Capitol building where he was murdered. It is the tallest capitol building in America. The Bridge is the highest. And no one knows who shot Huey. 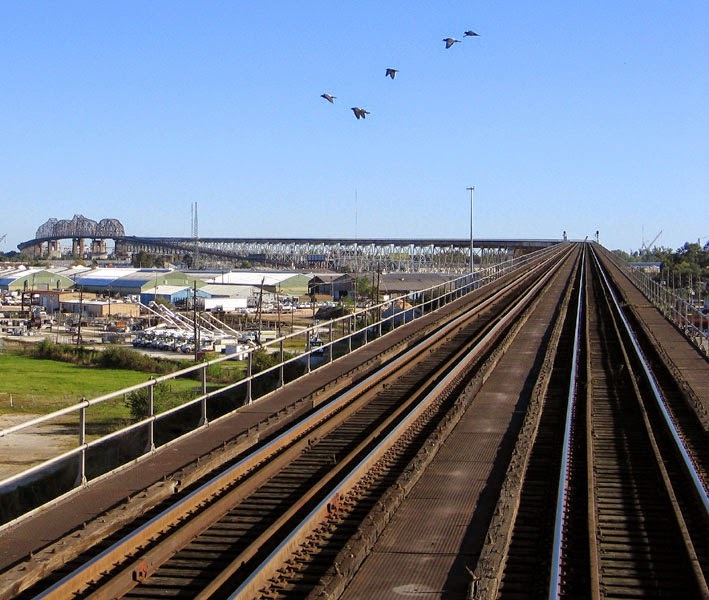 Before the bridge opened, all trains crossing The River at New Orleans did so aboard ferry boats that landed on the Westbank at the town of Westwego, a descriptive name given the settlement, in 1870, by the Texas and Pacific Railroad. Incidentally a second bridge, built later and bearing Long's name, crosses the Mississippi at Baton Rouge. 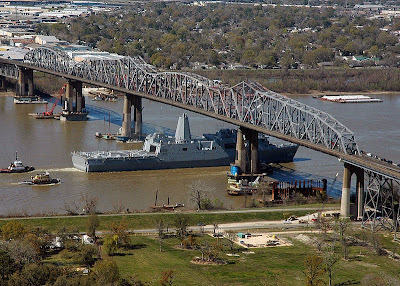 Both bridges have superstructures made of high-towered steel that looks, from a distance, like the skyline of a great modern city. Huey, the man, was only made of flesh. But he was some powerful flesh. Nicknamed "The Kingfish" early in life, his political career gave the nickname special significance as top-feeder in the Louisiana political pond. Huey Long's first elected state office was Railroad Commissioner. He first ran for governor in 1924, and lost. Brother Earl occupied the Governor's Mansion, fittingly, after big brother Huey had moved out. And while Huey may have been something of a rounder while there, he was fabulously circumspect compared to Earl. He used to say of his trysts with Blaze that he wore cowboy boots in bed, "For better traction on them hotel sheets." Something of a forerunner of today's destination hotels, Hotel Roosevelt sat across Canal Street from New Orleans undulating French Quarter, and was mighty popular with both Long brothers. 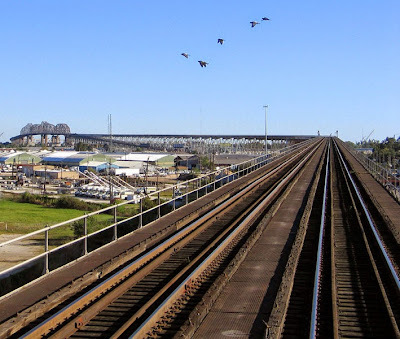 Huey even said he built the Airline Highway from his office in Baton Rouge, "To have a straight hard shot at the Hotel Roosevelt, in downtown New Orleans." The Longs built their political dynasty at a time when most Americans thought government should solve problems by direct action, not through secondary problem solvers. No trickle-downers, those two. Private health insurance's big bite out of today's health care dollar would strike them as laughingly overpriced, and inexcusably inefficient for the ones receiving the care -- the people casting votes. Taxing oil and challenging an incumbent president can make one enemies. Huey had his, then and now. He ended up, after all, assassinated in the lobby of the new skyscraper State House his taxes had built. Today, Huey's life-sized statue stands on the state grounds where he is buried, in front of the Capitol building he built. Another of him stands under the dome of the United States Capitol, in Washington, D. C. It is part of program by which "Two-heroes of each state," are honored. The other sent by Louisiana is Edward Douglass White, a Confederate veteran and, later, U. S. Supreme Court Chief Justice. Brother Earl spent time in the state loony bin during his term in office. Being governor, he cured himself by firing the institution's director and hiring a new one who released him. That tops anything Huey ever did. Even taxing Standard Oil. Earl once strapped a crate of Texas grapefruits to the grill of his car. He had purchased the fruit while at a loony bin in the Lone Star State. He was there at his wife's behest, and against his will. Of this incarceration, Fort Worth columnist, Molly Ivins, once told an audience at Tulane University, "Texas authorities took one look at Earl and said, 'Looks like a fine and fit governor to us,' and released him." With those Texas grapefruits strapped to the front grill of his black Cadillac he drove back to Louisiana stopping along the way to give sweet grapefruits to grateful voters. This parade included his aides, the press, police and his wife, who wanted to lock him up again. 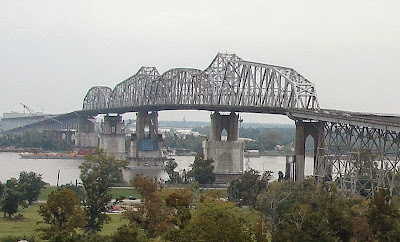 I have never learned where Blaze Starr was that day, but I like to think she was in the Cadillac with the governor and the grapefruit.Back to the KingfishHuey's construction projects, like the afore-mentioned bridge and State House, still stand. In other states, oil revenues are more equitably split with the state. Charity Hospital in New Orleans was founded in 1736 by the Sisters of Charity, and derives its name from them, not the universal medical care initiated by Huey Long. It is -- was -- the second-oldest hospital in the United States. Huey set out to build Charity into a skyscraper housing a model hospital, and making it the flagship of his statewide health system. The skyscraper opened four years after his death, and there is now a Charity Hospital in most every Louisiana city, but post-Katrina New Orleans. Huey's twenty floor high-rise hospital still stands, but as a dark hulking ghost towering over The Big Uneasy. After two hundred and seventy-five years, and countless "con-servative" plots to shut it down, Charity Hospital was felled by hurricane winds, faulty levees, and an unwillingness of the good people from Washington to spend Louisiana's offshore oil revenue to reopen it. But that is another story, maybe. Your comments are welcome. Please post them in "comments"
Frank Parsley's icebox magnet of LEJ and other Swamp goodies.